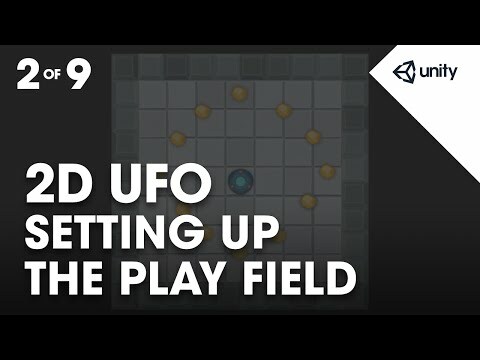 In this assignment we'll set up the play field for our 2D UFO game including adding sprites for the background and player. let's create our game board, or play field. which was imported when we imported our assets. In Sprites we'll see a sprite named Background. which scenes are made out of in Unity. or a coin can be it's own game object. with a transform component attached. rotation and scale of the object. allows it to play sound. shown in it's Sprite Field. or hierarchy is a shortcut provided by Unity. dragged sprite asset to be displayed. or the position (0, 0, 0) in our world. in the upper-right of the transform component. in our scene if it's not already there. in the scene are calculated from. of the background in the scene view. and type the F key. game object in the scene view. a reference for spacing in the scene. in the scene view and deselect Show Grid. Now let's create our Player object. be represented by our UFO sprite. to display the sprite we dragged in. game object from UFO to Player. and click in the text field at the top. With the text highlighted type Player. Now we have two sprites in our game. in front of one another. each of our sprites to a sorting layer. and then click the + button. by highlighting it and clicking the - button. The order of the layers here is important. list order from top to bottom. of objects in Background, and so on. as defined in the project settings. set the sorting layer to Background. Then highlight the Player object to Player. and set it's sorting layer. One way is to use the Scale tool. the handle rescaling the Player. title of the fields we want to change. in to the fields we want to change. pane of glass with an image painted on it. It's flat without depth or volume. which you can think of as our work area. actually see when they're playing the game. the player and we can't see the whole background. so that it can see more of the board. but it has a camera component attached. set the project type to 2D. their distance from the camera. let's temporarily exit 2D mode. our camera and our sprites. alt or option + dragging in the scene. we can see the camera's frustum. The frustum is the camera's viewable area. so does our view of the scene. grows larger in the camera preview. it does not appear larger in the frame. of our play field for our camera. Click on the game view. of our camera and drag. of around 16.5 works nicely. and the board is sitting on a blue background. for new scenes when working in 2D mode. This allows us to select the background colour. or enter a value numerically. let's use the values 32, 32, 32. This will give us a nice dark grey background colour. Player game object and a background play field.